Fei Fei | Fei Fei is gorgeous! It's a steely blue shade with a microglitter formula, from the Diva NYFW 2012 collection. I have been loving gray-blues for fall. Fei Fei has some duochrome properties to it as well. In certain lights it has a golden-brown cast which is stunning. I have also noticed some purple. Zoya is really the best at these foil finishes. Super shiny, sparkley, and smooth. Natty | One of my new-found favourites! This steely blue creme is the perfect colour for fall. Natty is part of the Designer collection. Noot | Noot is part of the Designer collection. It was a colour I was searching for this fall! It is a dark grey-green creme. It is one of those so dark it's almost black...but not colours. Great for fall. 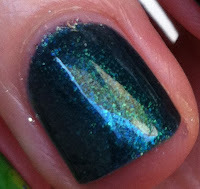 Wednesday | The collections that first introduced me to Zoya were Surf & Beach Summer 2012. This creme is a sage green and is very similar to Color Club's Age of Aquarius. Wednesday on the nails is slightly darker than in the bottle. Frida | Frida is part of the NYFW 2012 Gloss Collection. 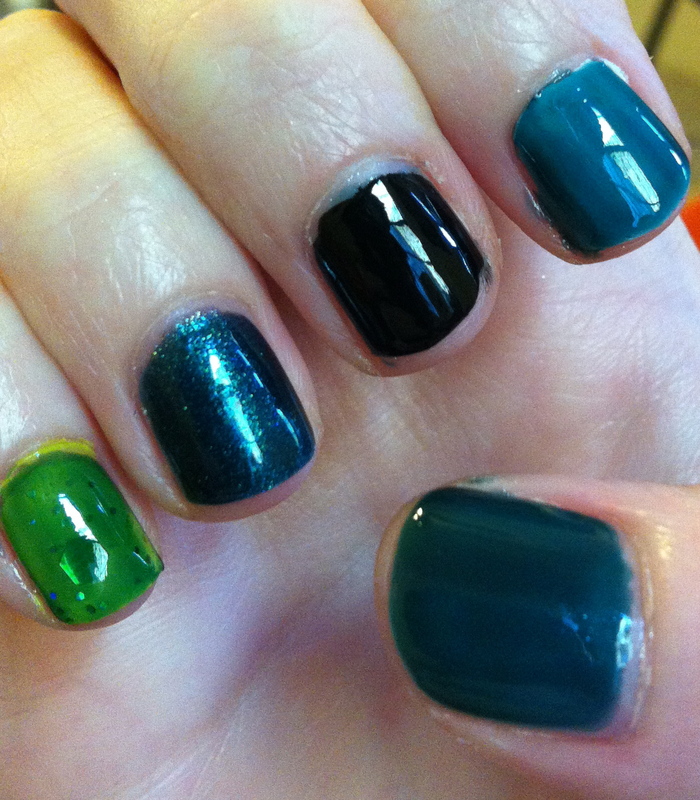 It is a dark blue-green (teal) jelly polish. The coverage is sheer, but it is buildable. I would suggest using it over a base colour if you prefer a solid look, and it is great for layering. Below are some various ways to wear Frida! Thumb | 3 coats of Frida alone. Fairly opaque but you can still see the nail, but it's not very noticable. Index | 2 coats of Frida over white. Middle | 2 coats of Frida over black. Ring | 2 coats of Frida over Fei Fei. 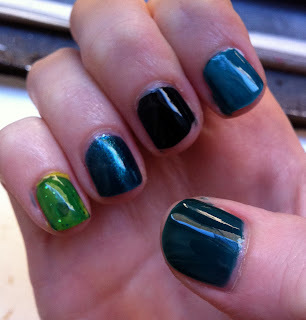 I saw this combination on Zoya's Facebook page & I love how it looks! The pictures really don't do this justice. I will definitely be using this combo as a full manicure. It gives a beautiful dark green-blue jewel tone look, like a sapphire combined with an emerald. Below is a macro shot to give you a better idea! Pinky | 2 coats Color Club Tweet Me, 1 coat Forever 21 green glitter polish, 1 coat Frida. Just wanted to show how Frida would look over a different colour. This lime green brings out more of Frida's green hues. Also wanted to semi-demonstrate how it would work to do a jelly sandwich. So those are the polishes I picked up for the start of fall! I highly recommend Zoya polishes they are amazing quality, cruelty-free, and big 5 free! I have been loving all their collections and highly suggest checking our their NYFW 2012 collections as well as their recently announced holiday collection. Also keep checking my blog for some more looks using these polishes! I hope everyone is enjoying the first weeks of fall! 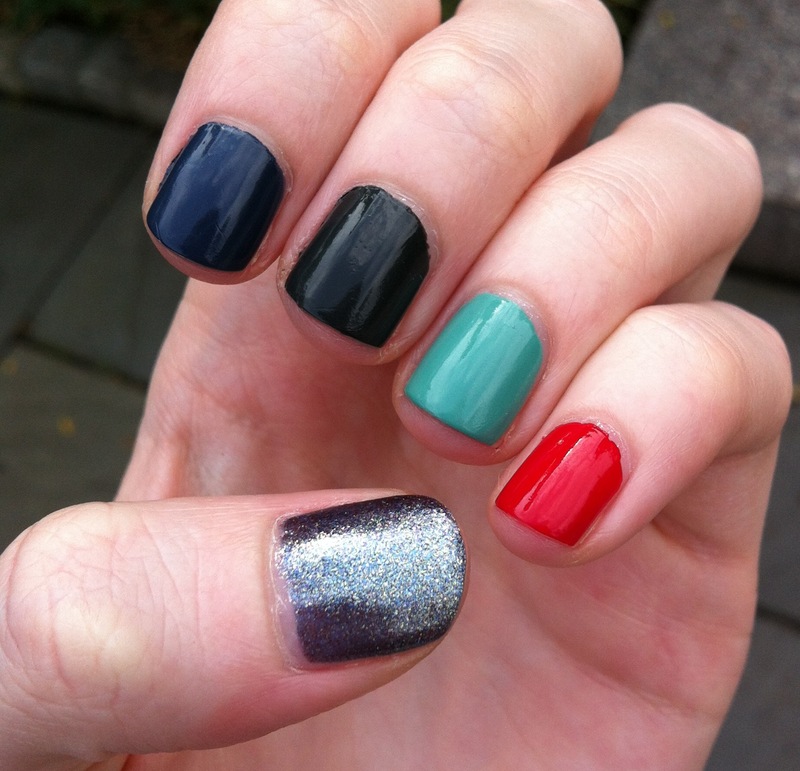 What are some nail polishes you have been loving for this season?